The lost wax casting process begins with the artist creating a sculpture from wax, clay or other similar material. Next a mold is made of the original sculpture. The mold usually has an inner mold made of latex, vinyl or silicone to preserve the fine details of the artists original sculpture. Once the plaster and latex molds are created, the first layer of wax is applied. The wax is applied by painting onto the rubber mold to capture the fine details of the original sculpture. Then molten wax is poured into the mold to cover the inner surface. The hollow wax copy of the artists sculpture is removed from the mold. In certain situations, the artist may reuse the mold to make more wax copies of the sculpture, but wear and tear on the mold limits the number of copies possible. The chasing process involves a heated metal tool that is used to rub out the marks that show the parting lines, or areas where the pieces of the mold come together. At this point in the process, the wax piece now looks like finished bronze. Next the wax copy is sprued with a tree-like structure of wax that will provide paths for molten bronze to flow in and air to escape. When the wax is lost the gates become avenues for the molten bronze to flow into the piece. The vents allow the gas to escape when the molten metal is poured in. The vents also prevent air pockets from forming. The slurry process involves a sprued wax copy being dipped into a slurry of liquid silica and then into a sand-like stucco. The combination of slurry and grit is called the ceramic shell mold material. The shell is then allowed to dry. The ceramic shell-coated sculpture is then placed in a kiln. The kiln hardens the silica coating into a shell and the wax melts and runs out of the piece, hence why the casting process is called lost wax casting. After the ceramic shell is allowed to cool, it is tested to see if it will hold water. If any water flows out, the cracks and leaks are repaired. The shell is reheated in the kiln to harden any patches and then it is placed in a tub filled with sand. Bronze is melted and then poured into the shell. The bronze-filled molds are now allowed to cool. The shell is now hammered or sandblasted away, releasing the rough bronze. For large bronze pieces, reassembly takes place with welding. The bronze copies are chased until all signs of the casting are removed and the sculpture looks like the artists original artwork. 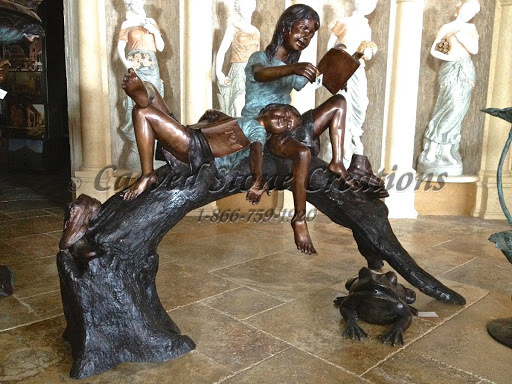 The bronze sculpture is colored using chemicals applied to heated or cooled metal. The coloring is called patina and can include black, white or brown colors. After the desired patina is achieved, a coating of wax is applied to the surface while it is hot to ensure durability of the color and finish. The wax coating also serves to protect the surface from oxidation and gives the piece a luster look. 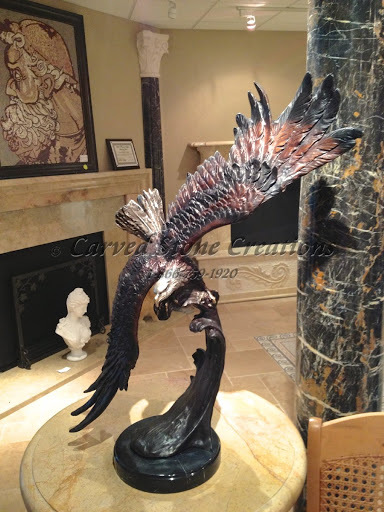 The bronze casting process is very intricate and produces beautiful pieces of art. View some of our bronze sculptures.